Local giving that's easier, automatic, and sustainable. GratisGives™ makes it easy to fund LOCAL non-profits you already know, by REDUCING merchant fees you already pay. It's the easiest way to support your local charities. GratisGives™... TOGETHER we can, together WE WILL. What if giving to local charities could happen in tiny, painless amounts? Now it can, AND while reducing fees you already pay. 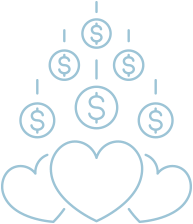 GratisGives™ turns a portion of savings from your new merchant account into tiny, effortless contributions for local non-profits. YOU keep the rest. Together with other local merchants, you can have a GIANT impact on local charities, while saving your business money. Two good deeds that turn great together. That's what GratisGives™ can do for your community. To local non-profits and the people they serve, your pennies can change lives. All because you saved money in your new merchant account. It's that easy. By sharing a portion of your savings – you pick the amount – your act of kindness combines with those of others for a huge impact on your community. Make two choices – a local non-profit and the portion of your savings to contribute. That amount, combined with other contributions like yours, will be presented to your chosen charity at the annual GratisGives™ event. Sometimes the hardest part about giving back is writing the check. Cash flow, timing, unexpected expenses... they all get in the way. With GratisGives™, they don't have to. 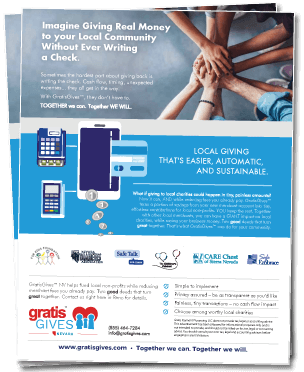 GratisGives™ NV helps fund local non-profits while reducing merchant fees you already pay. Two good deeds that turn great together. Contact us right here in Reno for details. saving your business money. Two good deeds that turn great together. That's what GratisGives™ can do for your community.